Thank you Dawn for this award! These are the rules for this award - Im off hunting for blogs to follow and be inspired by so I can fullfill this bit!! 1. Thank and link back to the person who awarded you this - Done! 2. Share 8 things about yourself - Done! 3. Pass it on to 8 bloggers that you have recently discovered - Done! 4. 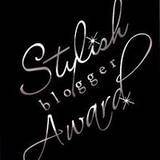 Contact those bloggers and tell them about their awards - Doing and will be done very soon! 2) As a child I moved round a lot because my dad was in the army. 3) I love chocolate and tea!! 4) I'm the youngest of 3 - sister 4 years older and brother 9 years older. 6) I used to do modern and tap dancing when I was younger. 7) I enjoy cooking especially with my children. 8) My teenage daughter and her friends call me Midge - because I'm only little!! 1) Ali - http://aqualeigasescape.blogspot.com/ I met Ali on the CMD forum and we've had lots of chats about kids as both our youngest are autistic. 2) Denise - http://deecymac.blogspot.com/ I also met Denise on the CMD forum. 3) Lorriane - http://lorraines-place.blogspot.com/ Another friend from the CMD forum! Lorraine is a fellow designer on CMD. 4) Kris - http://madaboutpoohsblog.blogspot.com/ And another from CMD forum! Kris does fantasic work raising money for charity. 5) Cards by Jacki - http://cardsbyjacki.blogspot.com/ Just been looking at this blog and liked it so here you are!! Look forward to getting to know you! 6) Crafts International - http://crafts-international.blogspot.com/ Another blog I've just found. I always have great respect for people who cope with illness and still manage to do something for others - Jude raises money for Alzehimers. 8) The Creative Cottage - http://the-creative-cottage.blogspot.com/ This blog looks lovely! Hey, Suz. Thanks ever so much, hun. That's brilliant of you. Much appreciated, hun. I'll pop it in my sidebar and complete the rest of the job when the Crafty Pad Challenge has been on top for a few days, OK? hey Suzi .thanks so much for dicoverying my blog and following me.Especially for this beautiful award. hope to get to know you over many bloggin years.